The Cherish collection from Dower & Hall will be on every romantic jewellery lover's wish list. 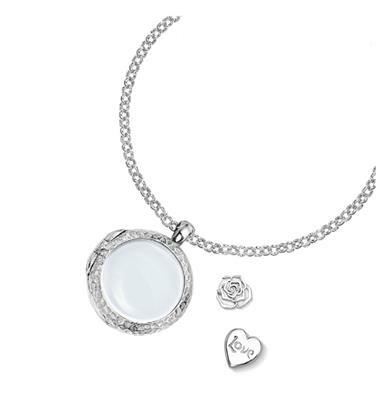 Beautifully crafted in 925 Sterling Silver with a hammered texture, the glass memory locket features delicate treasures with specific meanings, gently moving around your locket, this set celebrates loyalty and the delicate beauty of love! More treasures can be added to the locket to create a personal touch over time. Featuring the medium Silver locket on an adjustable 16-20 inch chain with two charms, the silver rose and silver love heart treasure.